Watch Binu Kannanthanam breaking the world record. 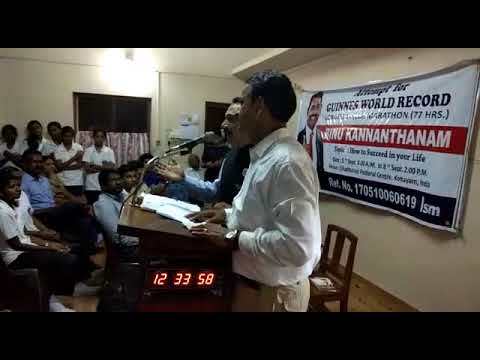 Binu Kannanthanam from Kerala made a world record by speaking continuously for 77 hours. He broke the record of Aswin Sudani which was 75 hours and 32 minutes. Here is an exclusive video of Binu Kannanthanam breaking the record. Binu Kannanthanam is from Manimala, a small village in Kerala. He has made Keralites around the world proud today. This record was the result of a seven-year long preparation. He was on a strict diet during the event. He ate only fruits and liquid food.